People outside the industry sometimes think of airports as nothing more than places for airplanes to land and take off. Halifax Stanfield (YHZ) in Nova Scotia aspires to be much more-for passengers and its community. The airport's multi-year capital improvement plan aims to upgrade facilities and expand current services to best-in-class levels. Located on Canada's east coast, YHZ links the Atlantic region of the country with destinations across Canada, the United States, Europe, the Caribbean and Asia. Last year, the airport welcomed almost 4 million passengers and processed more than 33,000 metric tons of cargo. "More than half of all the air passengers and air cargo that move in Atlantic Canada pass through our airport, creating a tremendously positive impact on Halifax and the entire province as an economic generator and supporter of growth," says YHZ President and Chief Executive Officer Joyce Carter. "It's imperative that we continue to invest in and further advance this valuable community asset." A concessions redevelopment program currently underway is a key part of the airport's ongoing evolution and long-term strategic planning. The project's goal is to bring more choice and new product offerings to passengers, visitors and the airport community. 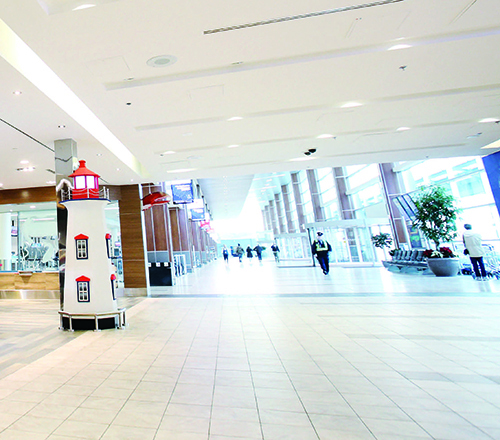 Jo-Anne McLean, director of Air Service and Terminal Business Development for the airport authority, notes that the retail landscape at YHZ has changed tremendously in the last number of years, and those changes will continue. "We are working with our existing partners, along with new ones, to ensure we provide our passengers with fresh concepts and more choice during their travels," explains McLean. "We are also committed to supporting local entrepreneurs and offering products that showcase and promote our region." The airport's newest tenant, Amos Pewter, opened shop in July, selling handcrafted pewter jewelry and home décor designed with inspiration from Nova Scotia's coastal surroundings. 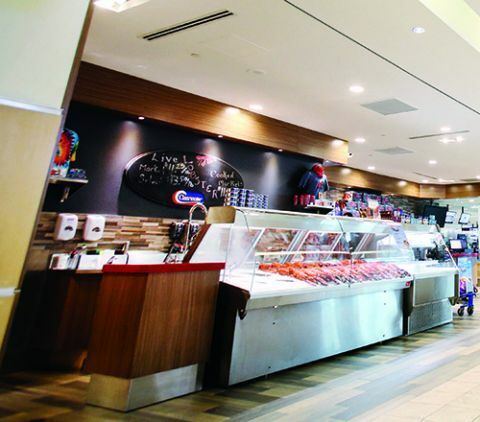 Clearwater Seafoods, located near the airline check-in counters, packages live Nova Scotia lobsters for passengers to take on flights as carry-on items. Other retail stores and kiosks that highlight local products include Eastcoast Lifestyle, The Nova Scotia Store, Hudson News, New Scotland Clothing Company, Miller's Kettle Corn and Liquid Assets. The local/regional focus is also guiding efforts to secure retail and food/beverage tenants for approximately 5,000 square feet of new concessions space recently constructed on the departures level. The ultimate goal is to make YHZ a catalyst for regional growth and transform it into a destination airport, explains McLean. Toward that end, the authority contracted Steven Baldwin Associates, an airport management consulting firm based in Albany, NY, to recommend ways to optimize all non-aeronautical revenue, particularly concessions. Alex Hopson, an associate with the firm, explains that consultants performed a comprehensive review of all lease agreements to determine the best use of terminal space for concessions. "The analysis examined square-footage, food and beverage, retail, news and gift revenue performance and customer service," says Hopson. "We found that in certain portions of the departures area, the demand was higher than what the existing concessionaires were providing. Traffic flow as well as passenger and airline schedules were analyzed, and it was determined that more food and beverage options could be sustained." With its consultants, the airport then examined the lease expiration dates of all vendors on the departures level and compared the existing configuration to its concessions master plan. Space was subsequently re-allocated in a phased plan based on lease expiration dates. There was also a "green" space opportunity to build a new concessions area, and YHZ asked the consulting firm to provide advice about what types of layouts should be constructed to allow the concessions program to grow with the airport. McLean explains that airport officials chose Steven Baldwin Associates specifically for its expertise in airport management and terminal concessions analysis. "We have been very pleased with the process and outcomes," she notes. The airport also switched from a master concessionaire model to a hybrid model with further direct leasing of some areas. It will continue to implement the updated concessions plan gradually, as leases expire. In July, space was being built-out by the airport, and more retail and food/beverage options were appearing. The airport's top executives note that they are committed to providing the necessary infrastructure to support YHZ as a significant economic engine for the region. "Responsible, effective management of the growth and development of the airport is essential to ensure long-term financial health," says Carter. "These improvements demonstrate our continued focus on safety, security, reliability and customer experience, and are necessary to meet the needs of our current and future passengers and visitors." The capital improvement plan is also designed to support service development efforts. "Enhanced facilities and upgrades allow us to grow with airlines that are currently serving Halifax Stanfield while making us more attractive to prospective partners," she explains. To help convey the airport's significance for the community and its economy, YHZ recently launched a rebranding campaign that included a new logo and tagline. "It was important that our new identity reflect the fact that Halifax Stanfield is not only a successful airport, but the backbone of business, the heart of a community and a place where anything can happen," comments McLean, who led the marketing initiative. The airport contracted two local companies, Sean Williams Marketing Group and m5 Marketing Communications, to perform initial research and help visually rebrand the airport. Interviews and meetings with stakeholders provided a clearer picture of how the public perceives the airport. The project team also studied benchmark airports throughout the world. "Our research showed that in Europe and Asia, for example, airports are more than just a way to connect to a flight," McLean says. "They're also a destination where people show up a couple of hours early to eat a meal or even get a workout." The new logo was designed to reflect the passenger experience at YHZ. "It draws on inspiration from the region and aviation, communicating a sense of flow, ease and connection," she explains. "It suggests an aircraft tail and runway, while revealing an 'H' for Halifax." The tagline, Connecting Means the World, was crafted to communicate the airport's potential to transform lives and act as a catalyst for regional economic growth. For McLean, it means far more: "It also mirrors the essence of Halifax Stanfield-the people who create a positive, human and caring experience through the personal connections made with passengers and visitors each day."